Around 4:20 the sound of fire trucks racing up MLK, their lights flashing, along with, oddly enough, the sound of utility trucks backing up, woke us up. My wife looked out east over MLK and saw just the fire trucks. Not much to report. Then she looked north over the Neighborhood and there it was. I am certain there was an expletive and rightly so. Flames were shooting up high in the sky over the tree tops and houses. Embers filled the sky. It looked like an erupting volcano. It instantly reminded me of the Morning Star Church fire back in 2007. Like so many others, we got dressed and went to see what was happening. Lights were coming on all over the street as people woke up. Looking up and down MLK, fire trucks lined the boulevard for 6, 7, 8 or more blocks. Firefighters were dragging a hose from a hydrant near the Nike store. That seemed like a long way away. We decided to walk up Rodney instead. At Morris, people were gathered. We stopped and watched for a bit and talked to some neighbors. We learned it was the new “Yellow” apartment building on the corner of Monroe and MLK. Water was falling from the sky like a light mist. While walking I heard crunches and thought dried leaves or similar. Turned out it was embers from the fire – not burning, but noticeable nonetheless. Many more people were gathered at the corner of Monroe and Rodney, some who had been evacuated from their homes. It was easy to see the truck ladders high in the air shooting water from above. It was also easy to see just how enormous the fire was. Soon a rush of water in the street reached the corner and doused the shoes of a reporter interviewing a neighbor. Looking back I think that neighbor was probably among the few seriously impacted. A short walk up Monroe and it was obvious at least 1 house was going to be lost. It turns out it had been converted to a duplex. A firefighter walked up to the door of the second house in from the burning building. A neighbor ran to tell him that his family was out and the door was unlocked, then we were all asked to move back to the corner. After talking with neighbors, watching the firefighting and watching reporters scramble for an exclusive it was time to return home. All the local TV station’s early morning news or morning shows were covering the BREAKING NEWS. 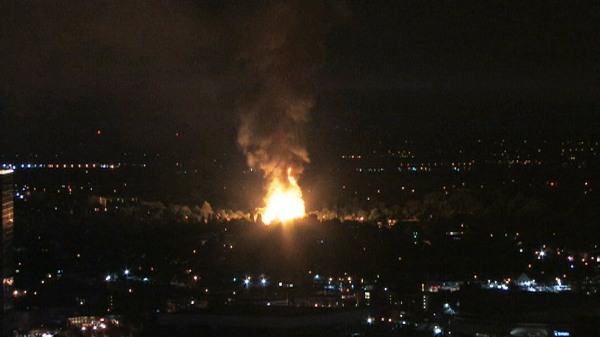 What really struck home was a shot over the city from a downtown camera that showed just how high the flames were out in the distance. Then, presumably, when the building collapsed, they shot up twice as high for several seconds. While walking to work along 7th several hours later there was time to reflect on the morning’s events. It’s great to see neighbors supporting each other in a time of crisis, but at the same time it is sad that often a time of crisis is the only time we see our neighbors. As I was noticing embers as far south as 7th and Hancock I was sad that yet another historic structure – if not 2 – were lost. Is it fair to note a house was already destroyed when the development started? I thought of all the time, energy and money spent and lost. I thought of our new neighbors who, after only a few weeks, or even days, now start the search for a home all over again and have to do so having lost so much.